In an area like ours where we are proud to boast a strong arts culture, “firsts” are hard to come by. But Main Street Youth Theatre is presenting not one, but two area “firsts” with their upcoming production of The Hunchback of Notre Dame. The show brings together an impressive blend of adult and young adult talent—part of Main Street Youth Theatre’s recipe for success. 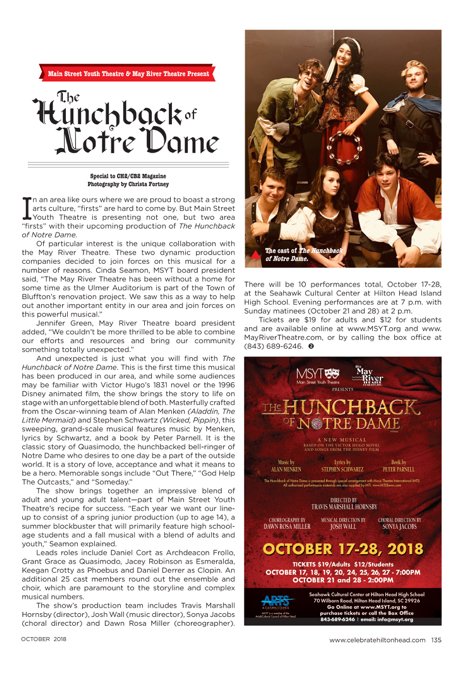 “Each year we want our line-up to consist of a spring junior production (up to age 14), a summer blockbuster that will primarily feature high school-age students and a fall musical with a blend of adults and youth,” Seamon explained. Leads roles include Daniel Cort as Archdeacon Frollo, Grant Grace as Quasimodo, Jacey Robinson as Esmeralda, Keegan Crotty as Phoebus and Daniel Derrer as Clopin. An additional 25 cast members round out the ensemble and choir, which are paramount to the storyline and complex musical numbers. The show’s production team includes Travis Marshall Hornsby (director), Josh Wall (music director), Sonya Jacobs (choral director) and Dawn Rosa Miller (choreographer). There will be 10 performances total, October 17-28, at the Seahawk Cultural Center at Hilton Head Island High School. Evening performances are at 7 p.m. with Sunday matinees (October 21 and 28) at 2 p.m.
Tickets are $19 for adults and $12 for students and are available online at www.MSYT.org and www.MayRiverTheatre.com, or by calling the box office at (843) 689-6246.